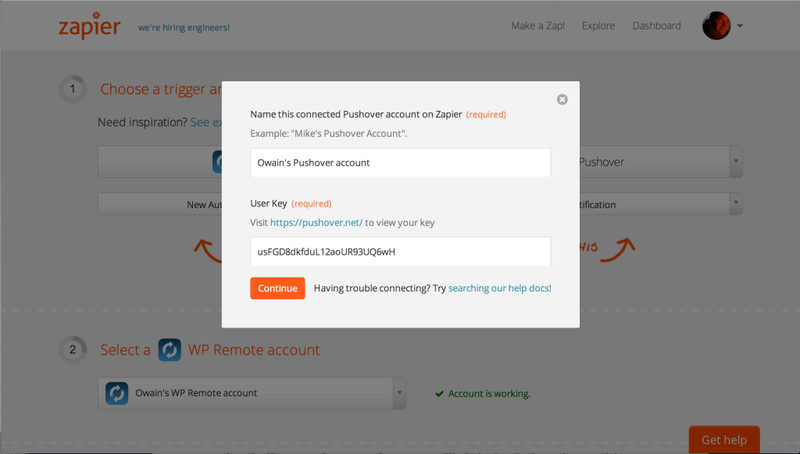 With WP Remote recently being added as an app to Zapier, we’re really excited to share some of the awesome Zaps you can create. 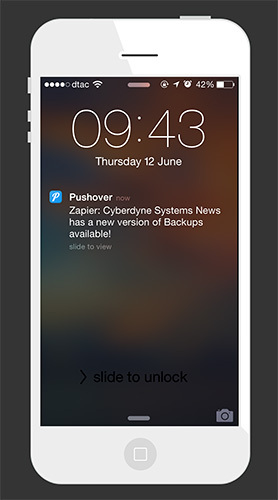 One of the most powerful Apps (aside from WP Remote of course) currently available on Zapier, is called Pushover. This simple but ingenious web API allows you to send custom data as push notifications to your mobile device. What I’m going to illustrate today is the power of Zapier. And I’ll be showing you how to send push notifications from WP Remote, to your mobile device. 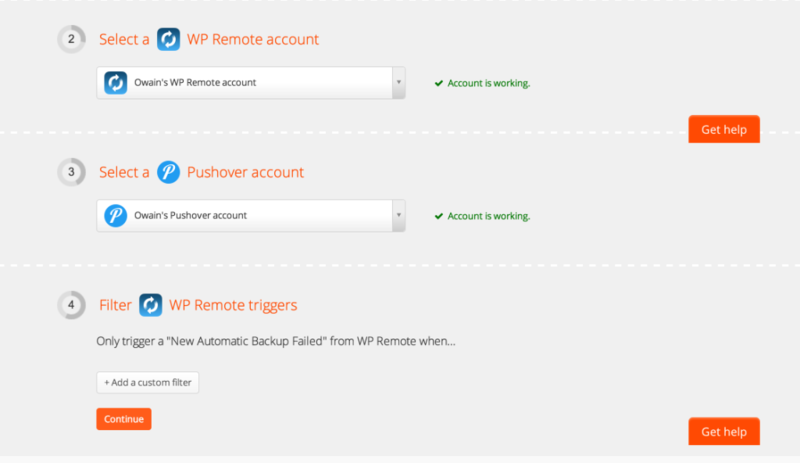 1 WP Remote Account with some WordPress sites added. 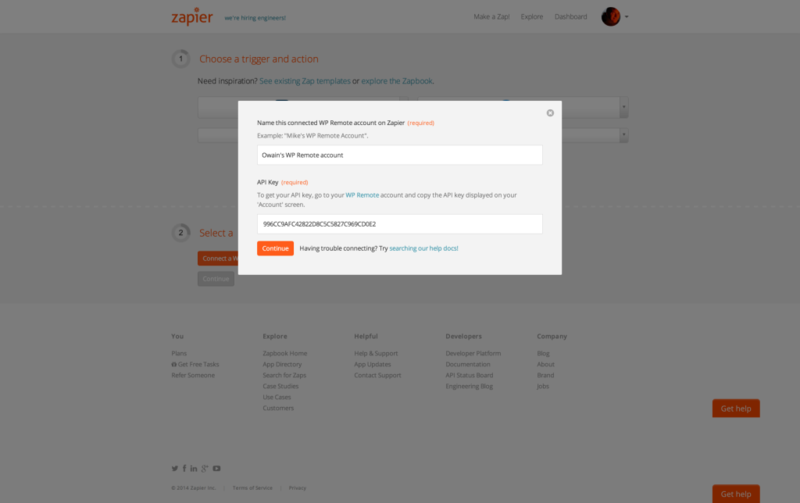 Let’s start by creating a new Zap and selecting the WP Remote as the trigger app, and Pushover as our action app. In the below image, I’ve selected the ‘New Plugin Update Available’ trigger, and for our action, I want to send a notification to my phone. We’ll now have to connect our WP Remote account, and push over account. A modal will appear. You’ll have to name the connection to your account. The second field you’ll be asked for an API Key. I’ll explain how to obtain your key next. 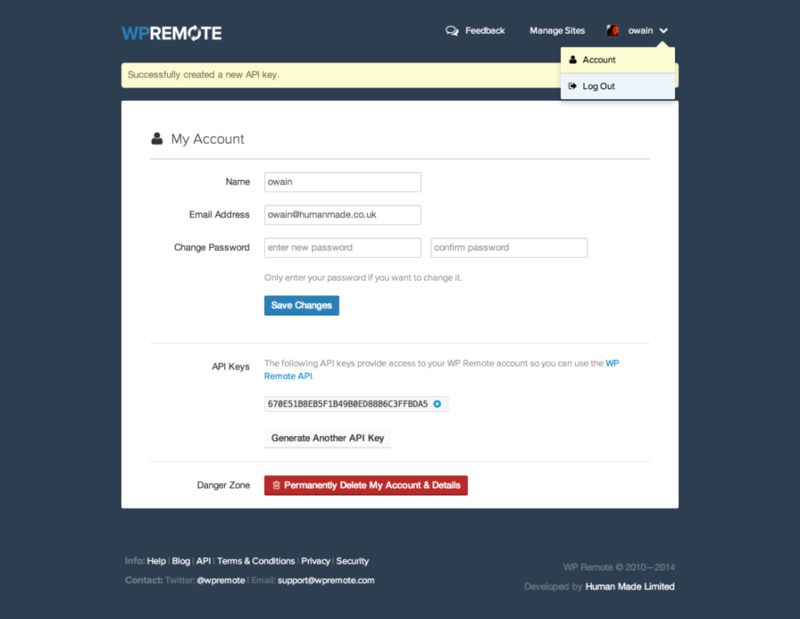 To connect your WP Remote account, you’ll need to generate an API key from your WP Remote account. Goto WP Remote, login, and go to your account settings page. To get here, click your username from the top right corner, and select account. Towards the bottom of the account panel, press the generate API Key, copy the API Key, and paste it into the field in Zapier. After you’ve added your API key, WP Remote will be connected. Next we’ll connect Pushover. To get your Pushover key is quite easy. Login to your Pushover account. In the top right of the Pushover home screen, copy ‘Your User Key’ and paste as below. We’re not going to be adding any custom filters to this Zap. But it’s worth mentioning that with custom filters we can do some advanced things, like specifying specific sites or plugins. We’ll save that for another tutorial. For now, lets press continue to move to the next part. Next we’ll setup the push notification message. I’ve kept things pretty simple for my Zap. Zapier is able to dynamically insert fields. In this case, I’m going to use the ‘site name’ and the ‘plugin name’ so that when my push notification reaches my phone I’ll know exactly what site and plugin it’s referring to. Zapier allows us to test our Zap with dummy data. You can do so now. If all goes well, it should say ‘Success!’ and your phone will alert you. Finally we name the Zap. You’ll only see the name in your Zapier dashboard, so you can make it descriptive, allowing you to see what a Zap does at a glance. After naming it, click ‘Turn Zap on’ and you’re done. 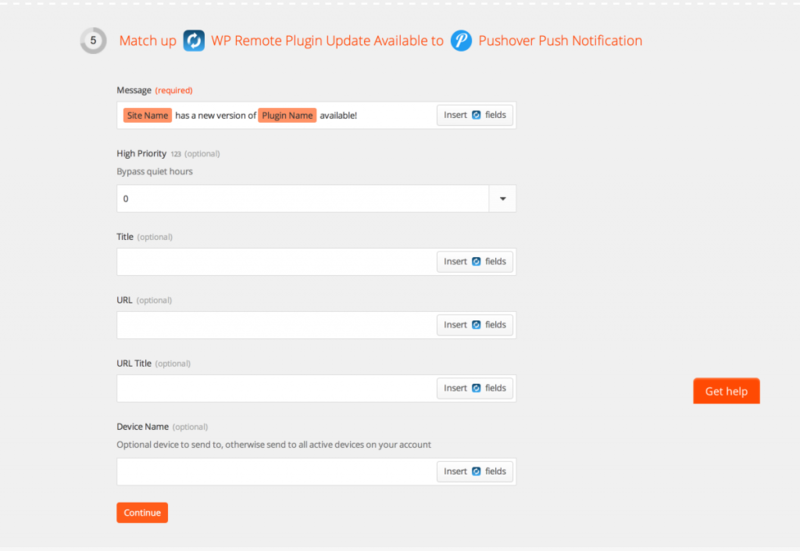 Whenever WP Remote detects a new plugin update, you’ll receive a push notification to your phone. 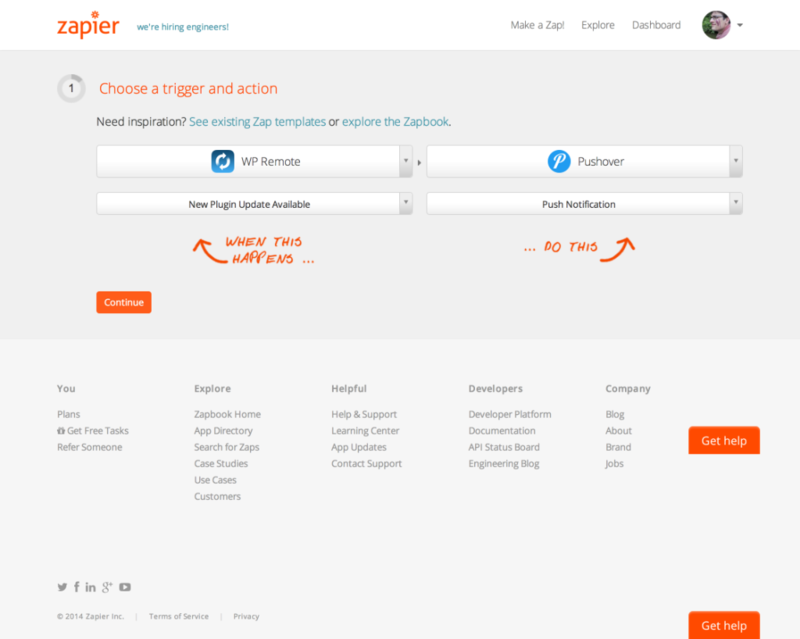 Expect more Zapier tutorials in future as we dive into more advanced uses. Also don’t be afraid to tweet us @wpremote if you want to see a tutorial with your favourite app.